Have fond memories of making the trip to the water park on a hot summer day? Nothing was more fun than the thrill of tearing down the slides at breakneck speed, anticipating the splashdown at the end of the tunnel. You might ride the same slide over and over until it was time to go home. But how can you commemorate that fun now? 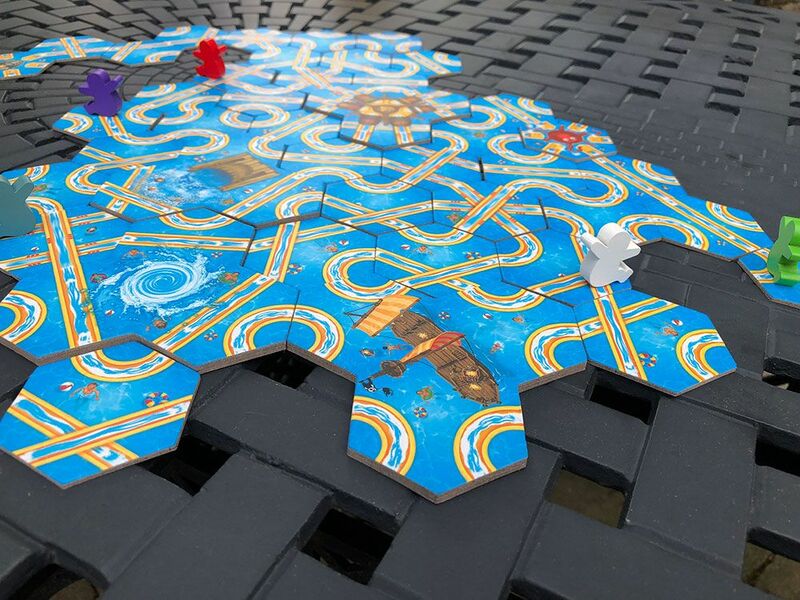 Enter Slide Blast, a family friendly tile laying game for 2-6 players where aspiring water slide architects seek to build the longest slide chute to score the most points. It’s designed by Sam-goo and Evan Song and published by FoxMind games. Place the large start tile in the center of the play area. Set aside the yellow backed tiles, large attraction tiles and bonus tokens. Shuffle the blue backed tiles and create piles within easy reach. Players place their pawns on matching colored chute on the starting tile. Players then draw a single tile and keeps it hidden from others, though they may peak at it. 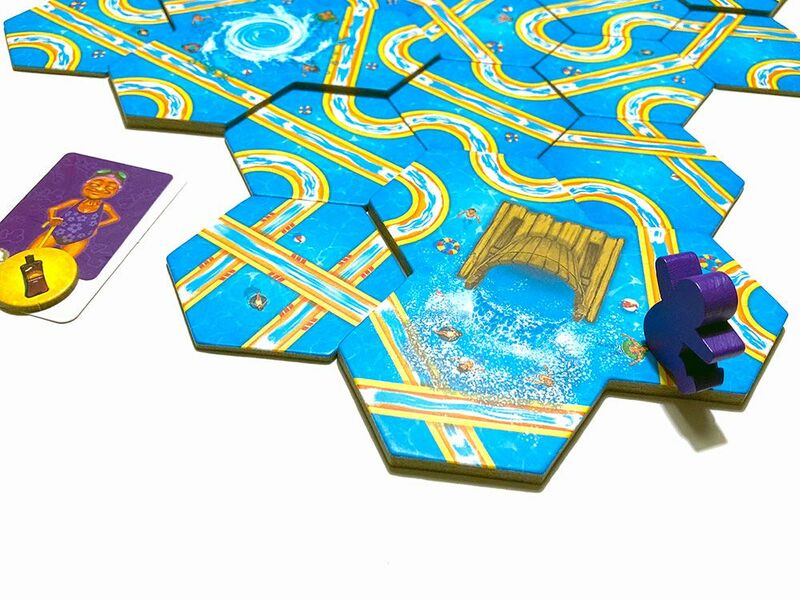 On each turn, players draw a new tile, review their hand, and decide which to play to extend the length of their water slide. Newly placed slide tiles have two simple placement rules: tiles cannot cause a collision between pawns or direct a pawn on a chute ending at the starting tile. If a High Speed tile (chute with red stripes) is placed, the player immediately draws another tile and plays a second tile. Only one High Speed tile can be placed per turn. Attraction tiles add excitement to the slides aesthetics along with providing strategic ways to connect to other slide sections. The tunnel tile provides the biggest advantage because two tiles are played; tunnel entrance and exit. The players pawn moves immediately into the tunnel and out the exit. If for any reason a player can’t place a tile legally, a lifeguard tiles are placed which act just like tunnels. While building slides, if a player’s tile moves another pawn in addition to their own, they collect a bonus token. It’s a perk for helping another player out. Play continues until the last slide is played. Players then return their pawn to the starting tile and count the number of slide tiles their pawn moves down. Take this total and add bonus points scored from tokens to declare a winner. Slide Blast is an immensely fun family game that can be played with children as young as four, with a little guidance. Its fast setup and ease of play will allow families to play multiple games in a short period of time. Replayability is pretty much limitless due to the random shuffling of the tiles and placement options. What’s really enjoyable is the puzzle-like strategy hidden within Slide Blast. As slides grow longer, connecting to tiles placed by others is critical. The most useful attraction is the tunnel, which allows placement of a second exit tile that can connected virtually anywhere. If the tunnel can connect to an existing path, it can significantly increase your score. However, exit tunnels can also help opponents that are close by, so place wisely. 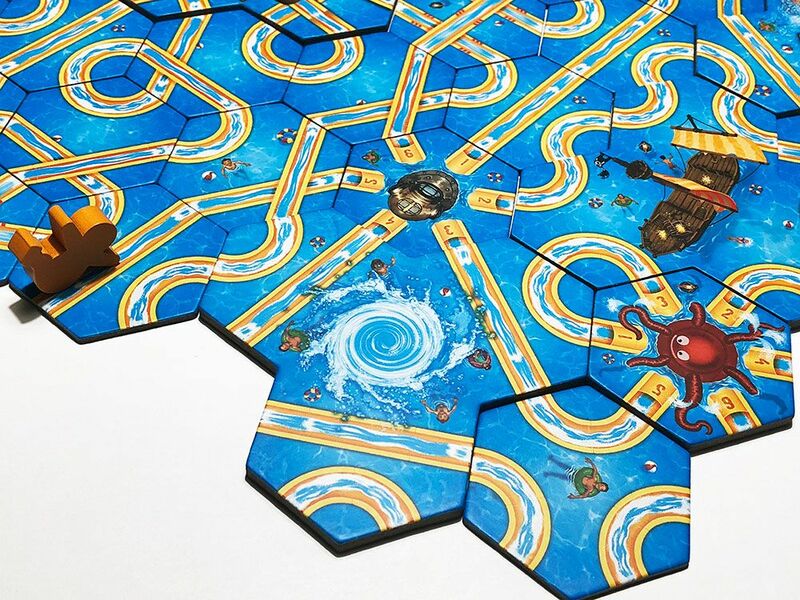 Speed tiles give players the advantage of extra draw and placement. When perfectly timed, take the opportunity to reach existing slide sections that are close by. Slide Blast seems very light at first glance. However, as slides are built, players will need to change up strategy and directional paths on the fly. After the first few plays my kids started experimenting with different ways to build their slides. They quickly recognized the importance of using tiles placed by others, and that moving another player wasn’t always necessarily a bad thing. 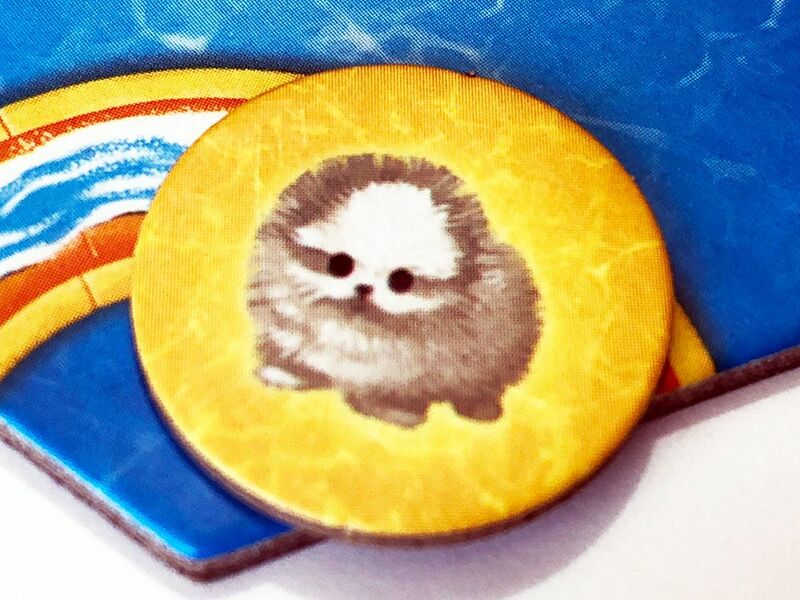 Bonus tokens are scored on a sliding scale, so a few extra points can mean victory in close games. My kids said the large attraction tiles were the most exciting to play, and getting to select which bonus tokens they got when helping another player was fun. Slide Blast’s theme is spot on and the artwork is awesome. It’s bright, colorful and has great detail. The attraction tiles sporting the most design creativity. 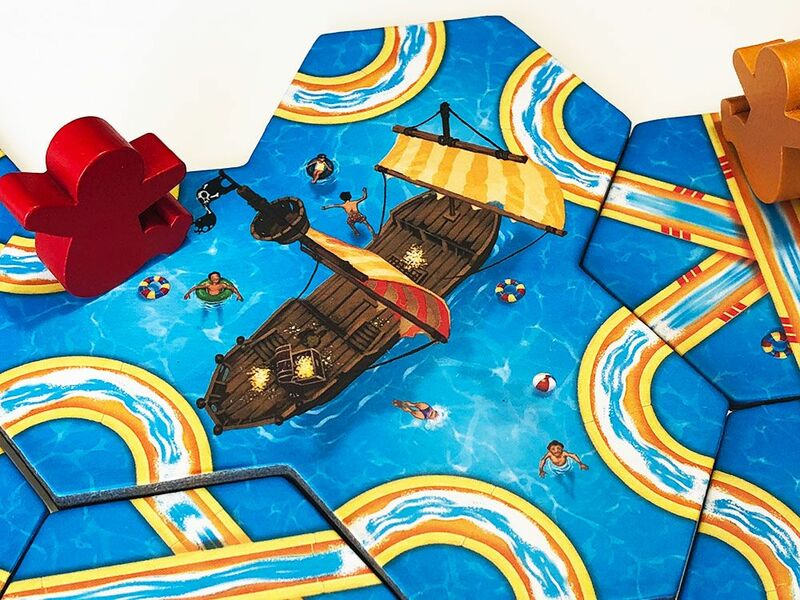 The pirate ship has a treasure chest overflowing with gold, whirlpool has guests swirling around, and the dump bucket people laughing and smiling as the bucket splashes down. Oh and don’t forget the most playful octopus that ever existed. The tiles themselves are made from thick chunky stock and will be easy for kid fingers to handle. It’s great for outdoor use on your patio table or on vacation. All in all, I have nothing but great things to say about this game. Aside from being a phenomenal kids’ game, will parents enjoy Slide Blast? Absolutely! 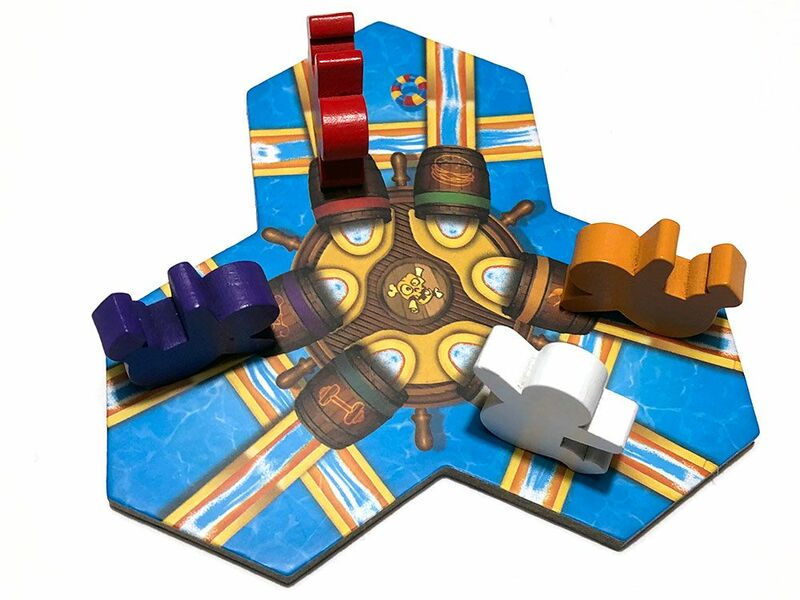 Parents who enjoy tile placement games, light puzzles, and varying paths to victory will want to play over and over. Our family has over twenty games logged and it still hasn’t lost its luster. We’re very happy this game is in our library and we never let it get sunburn by leaving it on the shelf for too long. Find Slide Blast on Amazon or ask for it at your local toy store. Thanks for you review of this game! We got it for my 6 year old’s birthday and it has been a popular choice.